The premise of the film “Black Klansman” sounds almost too bizarre to be true; a black detective successfully infiltrating the Ku Klux Klan. But it actually happened to Ron Stallworth. Photo Credit: Jorge Salgado/El Paso Inc.
Ron originally applied to the police academy in order to earn sufficient money to pay for college and become a high school PE teacher. But after a year on the job he was having too much fun and earning twice what he would have as a PE teacher. He was hired in 1972 as the first black police cadet in Colorado Springs and by 1975 became that department’s first black detective. After reading a classified ad seeking applicants to form a Ku Klux Klan chapter to be formed in Colorado Springs, Ron submitted a letter. But he “had a brain cramp” and signed it with his true name. Before long a message came in on the untraceable undercover police line and Ron found himself speaking to the local organizer. Ron carried on the charade so well he was asked to meet. Ron formulated a plan to capitalize on this opportunity. His idea was originally rejected by his Lieutenant but Ron and his Sergeant took his idea to the Chief and the investigation was green lighted. Ron was about to become a Black Klansman and was so convincing that he even had twice a week conversations with Grand Wizard David Duke. 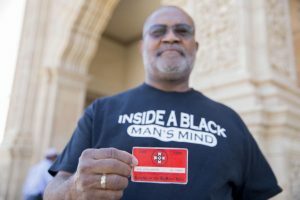 The seven and a half month investigation resulted in the prevention of several racially motivated incidents and identified a number of military personnel who were affiliated with the Klan. The investigation was shut down when Ron Stallworth was unanimously elected to become the chapter leader. He was ordered to destroy all the files but he kept two notebooks, knowing full well someday no one would believe the story of the Black Klansman. Ron kept the investigation and his role a secret for 27 years but wrote his book “Black Klansman” in 2013.